Vantage over Byron offers 5 bedrooms of absolute luxury with panoramic views of Mount Warning, Julian Rocks & the iconic Byron Bay Lighthouse. Outside the sleek infinity edge glistens and the overall effect, indoors and out, is modern without being minimal. So although the beach awaits, it’s hard to tear yourself away from the house’s clean-lined comfort and stunning views. Vantage over Byron is an architecturally designed oasis located on one of Byron Bay's most prestigious streets. With views over the town, hinterland and ocean, this location could be considered one of the best in Byron Bay. Vantage over Byron offers dual living spaces, one with a gas fireplace, and a large open plan dining area that takes in the rolling hinterland and the Pacific Ocean. The kitchen is fully equipped with high end European appliances and there is a wet bar and BBQ flowing onto the lower deck. Vantage over Byron also offers disabled access with a glass shaft lift that accesses all levels of the house from the garage. The master retreat boasts views over the infinity edge pool to the hinterland, a walk in wardrobe, and stunning travertine bathroom. There are four other bedrooms, one with ensuite and all bathrooms have heated Italian stone floors. The house is child friendly and there is also a children's playhouse in the garden. Located only a 2 minute walk down the road is one of Byron Bay's most popular coffee haunts, and it is under 10 minutes on foot to the CBD and beach. 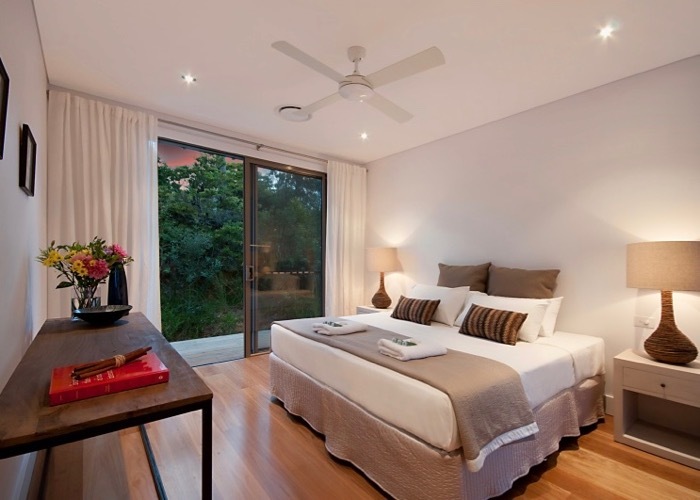 Whether you prefer wining and dining at world class restaurants, cheap, cheerful and delicious cuisines, rest and relaxation with a good book, whale watching, swimming with dolphins, surfing Main Beach, shopping, or strolling through the local markets, Vantage over Byron is the perfect accommodation. A security deposit of $1000 will be processed 1-3 days prior to arrival. This is held as a pre-authorisation on a credit card and is removed after 7- 10 working days arranged directly with management. Strict no party policy fees and eviction can apply for security call-outs (in response to the noisy neighbour hotline). Group policy - family groups only and maximum of 8 adults. Vantage Over Byron is a 5 bedroom house that can accommodate up to 8 adults and 3 children. The master bedroom has a king size bed and an ensuite bathroom. There is also a queen size bedroom with ensuite. There are 2 bedrooms with 2 singles in each (or king on request) and a bedroom with a bunk bed and a single trundle bed. The last 3 bedrooms share a central bathroom. Vantage over Byron was the perfect choice for our girls weekend away. Even though it was bucketing rain, the upstairs loungroom was cozy and perfect for the 9 of us to enjoy drinks and nibbles in style. The next day, cocktails on the balcony, enjoying the sunset over the mountains and bay was the ideal way to end a fabulous day of shopping in town. Although we were a large group, we all found plenty of hidden balcony spaces to hide away for some quiet reading and the pool deck is perfect for an afternoon snooze. The kitchen is very generous, with everything we needed to prepare feasts around the biggest dining table i've ever seen! I would highly reccommend Vantage for families or a group of friends. You'll really find it hard to leave... we did!!! Thanks again Alluxia for the recommendation, it was perfect!